Several events across northeastern North Carolina involved the North Carolina Coastal Federation on Saturday, March 24, providing opportunities for people to learn about low-impact development, stormwater runoff, oysters and more. 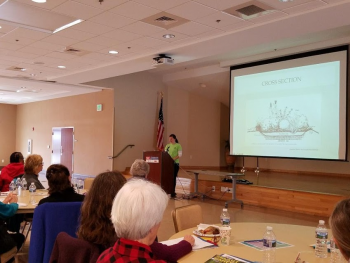 Ann Daisey, community conservationist at the federation’s Wanchese office, presented at the Tri-County Home Landscaping and Gardening Workshop in Barco in Currituck County. This event brought together extension gardeners and specialists, and more than 75 people attended. Presentation topics included the importance of native plants for pollinators, tree health and how climate change can affect plants. Daisey speaks at the Tri-County Home Landscaping and Gardening Workshop in Barco in Currituck County. She spoke about how to reduce stormwater runoff at home by incorporating rain gardens into landscapes, as well as by using cisterns and rain barrels. Daisey also explained the importance of mimicking nature by allowing precipitation to infiltrate into the ground rather than run off the land into waterways, bringing pollutants with it. “With six different speakers, speaking on different topics, it was great to see how the main theme of being a sustainable gardener shined through, and that in the end, it helps the natural environment and makes for a healthy yard,” Daisey said. Gardeners also received a copy of Smart Yards, which is a DIY guide to implementing practices that reduce stormwater runoff. In Elizabeth City that same day, AmeriCorps member Reilly Kelly hosted an educational exhibit during Green $aves Green Expo, a community event organized by the Albemarle Resource Conservation and Development Council. This event brought together vendors and organizations that offer eco-friendly goods or services. Attendees could leave with an “action plan” to make their homes and yards more environmentally friendly in an economical way. Kelly’s table focused on low-impact development (LID) practices. She set up the LID model house, which demonstrates how various LID practices, like a rerouted downspout or a rain garden, help reduce stormwater runoff. She also had a small rain garden demonstration set up using a water bottle with sponges to filter the stormwater. Kelly had people play “How Much Water Does It Take,” in which they had to match how much water it took to complete a daily task, like brushing teeth or doing laundry. She also passed out the federation’s Smart Yards. The Albemarle Resource Conservation and Development Council aims to make the Albemarle area a model “green region” in North Carolina where economic development is balanced with protecting natural resources. For the final event that day, Michelle Clower, coastal specialist, talked about the federation’s oyster restoration work at Shuckin’ It on the Water: A Blue Water Grill Experience. Chef Evan Hayes prepared six dishes featuring oysters for the event, which was part of the Taste of the Beach Event. Clower spoke about the history of oysters in North Carolina and basic oyster biology. She also spoke about ongoing small-scale oyster shell recycling efforts in the Outer Banks and northeastern North Carolina. Blue Water Grill also generously gave free tickets to volunteers who pick up recycled shells from the restaurant and bring them to the federation’s office.